From Indonesia's vast archipelago of more than 13,000 islands, the island of Sulawesi stands out for its unique shape comprised of four large peninsulas. It is also an island of dramatic extremes, from rugged volcanic peaks and beaches to two vastly different tribes, the seafaring Bugis and the mysterious highland Torajans. Start your exploration of Sulawesi from the provincial capital Makassar, peopled by Buginese, Makassarese, Mandar and Torajan ethnic groups. 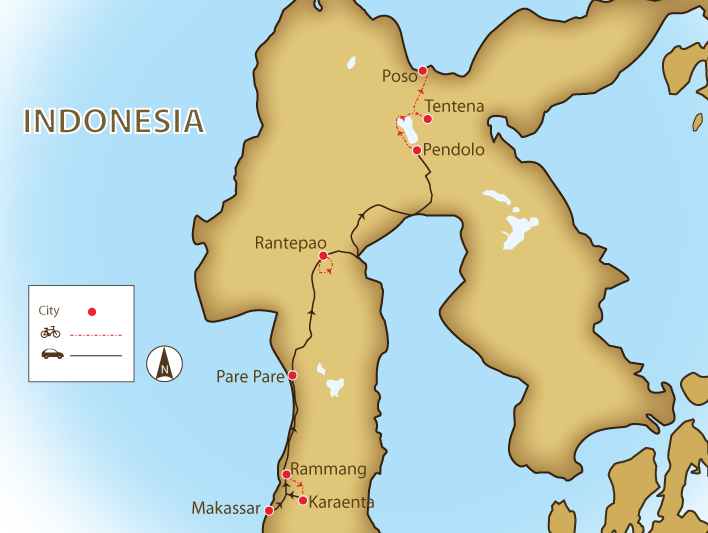 Pedal north, over the southern and central mountain ranges and rice plains, to arrive at the port of Poso. Discover the charismatic local cultures of the Tana Toraja Region, starting with a visit to Kete Kesu; one of the oldest ethnic Torajan villages. Here we'll learn about their complex funeral rites and see their cliff graves. We continue on into the mountains and discovering serene Lake Poso. We end our tour at the coastal town of Poso, which is also one of the biggest and the oldest towns in the province. We arrive and transfer to Rammang Rammang to trek from the world’s second-largest karst. Cycling to Leang-Leang, we discover pre-historical gardens riding to Samangki, home of endangered macaques. We take a scenic drive through Bugisnese villages to Toraja. We lunch in Pare-Pare and drive to picturesque Puncak Lakawan, with spectacular views, before arriving at Rantepao. Explore the Tana Toraja region before visiting Londa, famed for their ancient rock tombs. Ride on to Lemo and Kote and learn about baby tree graves before cycling back to Rantepao. After a short transfer, we ride to Alang-Alang and Kanuruan villages and visit the Madandan market before arriving at bustling Makale city. We end our day of cycling at Tondon Kalembang. No cycling today as we drive from Rantepao to the mountains. We break at Kayulangi Waterfall on our way to Lake Poso; a large, fresh water lake with white sandy beaches. We tackle mountainous village roads and cycle along the western edge of Lake Poso, passing by picturesque little bays, white sand beaches, and a wild orchid lakeside reserve near Bancea village. Cycling to Saluopa Waterfall, we continue to a Balinese village where we get a chance to connect with the locals and observe Indonesia's cross-culture roots. Riding from Tentena through forested hillsides and terraced valleys to coastal Poso, we enjoy freshly caught fish for dinner and overnight in a beachfront hotel. We transfer you to Poso Airport for your onward flight or to stay on and explore more of Sulawesi. Day 1 - Makassar Loop Ride 15km. +975m / -1,061m. This tour is primarily on sealed roads with some short sections on packed dirt paths with a total riding distance of 268 km in five and a half riding days. There are two days of transfers, and we will stop along the way at points of interest. There are a few hilly days with climbs, and the last day of cycling is overall a downhill to the coast. The trip is fully supported, and your guide’s expert knowledge of the area and terrain means that you always know what is coming up in terms of distance and difficulty. This makes a tremendous difference, as does the constant supply of cold drinks, ice, and fresh fruit. Biking Conditions: This trip is mainly on good quality tarmac roads and some vehicle-width dirt roads. There are some undulating sections; however, participants can cycle as much or as little as they like and still enjoy the same views as the rest of the group. Upon arrival in Makassar, meet your guide before transferring to Rammang Rammang, a remote village in the middle of the karst area. We start our exploration by trekking from the second-largest karst in the world and enjoying the stunning scenery of the majestic karsts and lush rice fields as we continue to Leang-Leang by bicycle. Discover the pre-historical garden, scattered with beautiful rocks, and explore local caves adorned with pre-historic hand-prints and paintings. Next, it's back on the saddle as we cycle to Karaenta in Samangki village, home of the endangered black/browned furred macaque (Macaca maura). After breakfast, we take a scenic drive along Bugisnese villages with their typical houses as we make our way to Toraja. We stop for pictures along the way and lunch at a local seafood restaurant in Pare-Pare. Once sated, we continue to Puncak Lakawan by car, where you have spectacular views of the surrounding area. We reach Rantepao in the late afternoon and enjoy dinner at our hotel. We explore the most charismatic places of the Tana Toraja Region, starting with a visit to Kete Kesu, one of the oldest Torajan villages with a Tongkonan (the traditional ancestral house, or rumah adat, of the Torajan people) and old traditional rice barns with colourful woodcarvings. We break at Londa and discover ancient tombs in which the deceased was not buried, but rather placed among the rocks. Then we cycle to Lemo with Tau Tau statues and hanging graves, believed to have originated in the 19th century. Death and burial, ruled by a complex set of long-established customs, are an ever-present feature of life for the isolated and predominantly animistic Torajan community. We ride to Kote and learn the secrets of the baby tree graves where dead babies are 'buried' inside the trunks of living plants to be 'absorbed' by nature. The trunks are patch-worked with little niches, each the poignant final resting place of a baby who died before cutting its first tooth. We ride back to Rantepao via Randang Batu in plenty of time for you to enjoy the hotel swimming pool. After breakfast, we transfer to our starting point where we hop on our bikes and ride towards Alang-Alang and Kanuruan villages, exploring the market of Madandan and passing the little-used airport at Rantetayo, all the way to bustling Makale city. We don't spend too much time here but, instead, pedal on to Tondon Kalembang where we discover the traditional cliff-front stone graves that the area is famed for. Today, we take a break from our bicycles and leave Rantepao for the mountains. We stretch our legs with a stop at Kayulangi Waterfall. Our destination is Lake Poso, a deep freshwater lake with stunning white sandy beaches, surrounded by densely forested mountains. Upon arrival, there is time for a refreshing swim, to relax on the beach or just to lounge in your tranquil lakeside cottage. We dine at the hotel tonight. Today, we take on mountainous village roads and cycle along the western edge of Lake Poso, passing picturesque little bays, white sand beaches, and a wild orchid lakeside reserve near Bancea village. We stop at a local school and say hello to the kids and their teachers. The road is rough in places, and there are some mean ascents. For the most part, the road winds through forest and small coca-growing villages with many of the locals using bikes from bygone eras. We start the day with a ride to Saluopa Waterfall. This 12-level waterfall has a stone stairway that can be used to access the waterfall’s many clear water basins. After our refreshing soak, we get back on the bikes and ride to a Balinese village where we get a chance to connect with the locals and observe Indonesia's cross-cultural roots. From Tentena, we gloriously descend through forested hillsides and across bridged river gullies and terraced valleys to coastal, and mostly Muslim, Poso. As we descend 600 m, there is a noticeable increase in temperature as we get closer to the coast. This harbour town is famous for its fresh grilled fish, which is what’s for dinner, and its village cakes (which we’ll have for breakfast). We overnight in a beachfront hotel in Poso. After breakfast, we transfer you to Poso Airport for your onward flight or you may choose to stay on and explore more of Sulawesi. Because some people can't imagine going on a trip without their own beloved bicycle, we do not provide them as part of this tour. However, you can hire bikes locally for the price listed in the tour pricing section. The bikes are well-known makes of mountain bikes with lightweight alloy frames, 24- to 27-speed gearing, disc/v-brakes, and Shimano components and front suspension. If you bring your own bike, please make sure it is a mountain bike, preferably with front suspension, in good mechanical order. Citizens of 169 countries and territories can enter Indonesia visa-free for a 30-day tourist stay via 29 airports, including Jakarta and Denpasar, Bali. For a longer stay, please apply for a visa-on-arrival for a fee of $35. More information on visa-on-arrival can be found here. You can also apply for a visa in advance, please contact the Indonesian Embassy in your country for the cost and details of obtaining one before you visit the country. Please check as this might be more expensive and more of a hassle than acquiring on arrival. Recommended vaccinations include typhoid, polio, tetanus and Hepatitis A. A certificate for Yellow Fever is required if arriving from an infected area within the prior six days. The more remote areas may be considered malarial areas. Please check with your doctor prior to departure for the most recent information. Indonesia is a vast archipelago affected by a series of weather patterns, and depending on which island you are on, the weather can be hot and wet or hot and dry. Indonesia's monsoonal climate usually means short heavy downpours rather than all-day, never-ending rain. Located 8 degrees south of the equator, Bali is home to a tropical climate with constant temperatures during the day ranging from 28 C to 30 C at sea level, although the humidity varies throughout the year. It is highest during the rainy season which is from December to March and gradually reduces to its lowest level from May to September, when a beautiful dry cooling breeze blows across from Australia. Lombok also has a tropical climate similar to Bali's, with the only variation being the rainy season starting earlier, and is from October to April. Sulawesi has a warm tropical climate with wet and dry seasons lasting approximately six months each. The dry season is from April to October and the wet season is from November to May. Sulawesi enjoys year-round temperatures averaging at least 30 C.
Meals are included as per the itinerary where B = breakfast, L = lunch, D = dinner. Most meals are local Indonesian dishes and feature noodles, rice, curries, and soups. Any special dietary requirements can also be catered for as well. Please let us know at the time of booking. Keeping you completely hydrated is a job we take very seriously. Cold water, some energy-restoring local fruit and soft drinks are included in the tour price. We are riding in a Muslim country and though beer is available, it might not be served in some restaurants. If you choose to purchase some beer please note it is NOT included in the price. We recommend that you tuck away a few extra dollars, perhaps US$10, for incidentals. It is customary to tip local tour guides and drivers, however, the amount you give should be dependent on the level of service you receive. As a general guide we suggest US$3-4 per person per day is appropriate. The official currency in Indonesia is the rupiah (Rp). Foreign currencies are not generally accepted. ATMs are widely available in cities and towns and touristy places have lots of moneychangers as well as banks. Banks usually have better exchange rates, though moneychangers may offer the best rates for cash. Credit cards can be used for larger purchases, in international hotels.